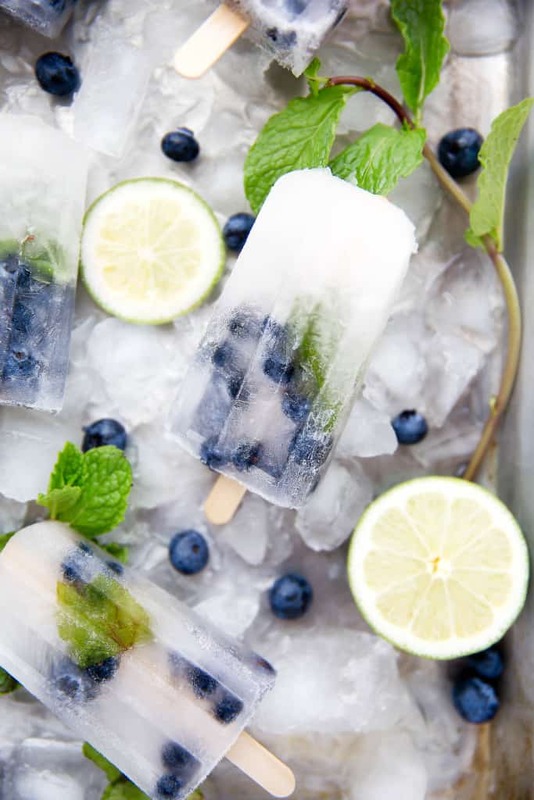 Who doesn’t love cool, refreshing homemade popsicles in the summer? I know I do. As much as I love grabbing a pint of Ben and Jerry’s, there’s nothing like grabbing a homemade pop. They’re a great treat to bring to summer parties or just to keep in the fridge for family and friends stopping in. They’re also great because they’re usually low calorie and low fat since not much goes into making them. 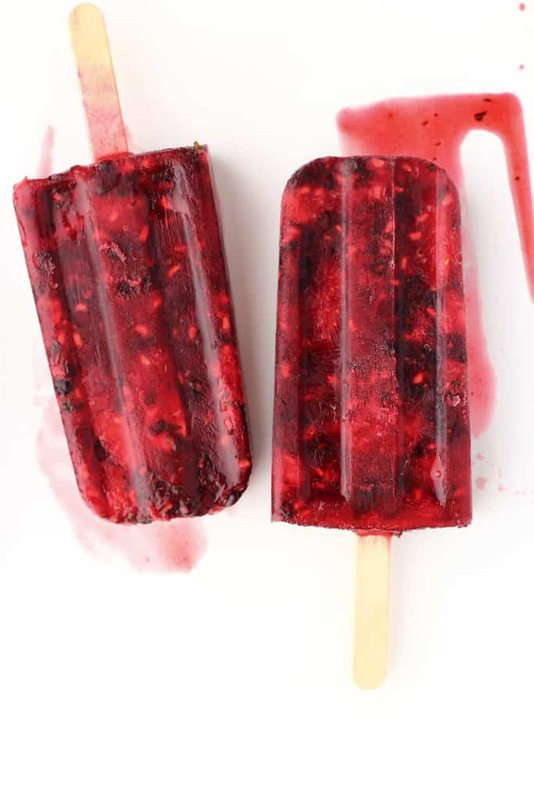 So, how about making your own batch of popsicles? Just like any meal, it’s a good feeling when you know exactly what’s going in your food. You can customize your own flavors, too, and even make up some flavors that you don’t see in the grocery store! 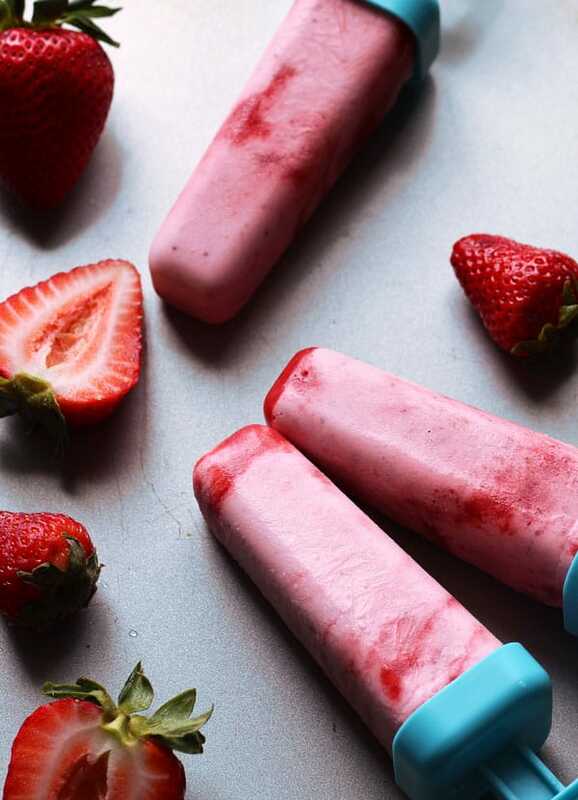 You also don’t need a lot of kitchen gadgets, except for a popsicle mold, like this one here. They’re all super easy to use — just fill and freeze. Now’s the tricky part. What to make? Well, like I said, the great thing about popsicles is that you can make whatever flavors you want — strawberry, raspberry, banana, orange, etc. But all of those ideas can certainly seem overwhelming, so here are some delicious looking flavors we’ve seen. And bonus — there are a few alcoholic pops in here, too! Looking for a more traditional pop? 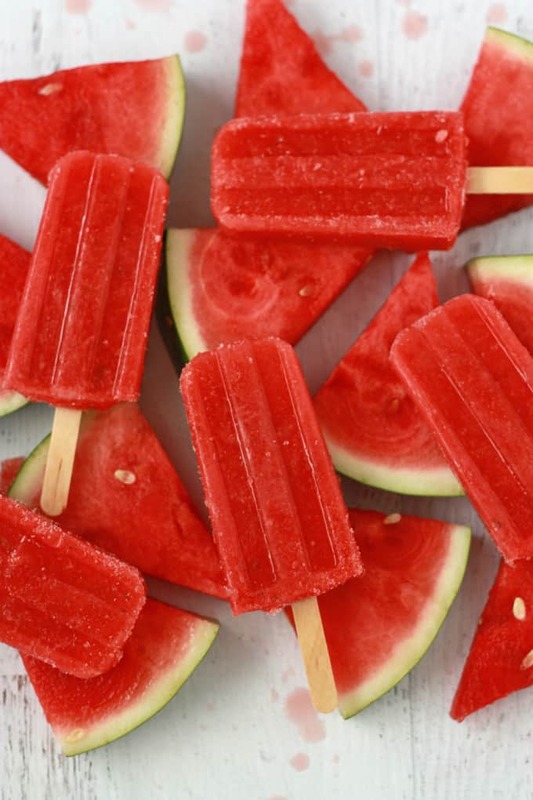 Strawberries and watermelons are essentially the fruits of the summer, so why not combine them? All you need is a few cups of cubed watermelon, a cup of strawberries, and a lime. Could that get any easier? No added sugar, no preservatives, no nothing but fruit! The more berries, the better! The recipe combines the basic berry necessities: raspberries, blackberries, and strawberries. And, all combined with mint? How refreshing does that sound? Yes! It’s a recipe that not only tastes good, but one that you can feel good about having an extra pop or two. Oh my goodness, how creative does this sound? I’m obsessed with roasting veggies to bring out that extra flavor, but I’ve never roasted a fruit before. Matcha is a great combo given the extra antioxidant power (as we know, blueberries are also full of antioxidants), and it even will give you a bit of a caffeine buzz. This dad knows what’s up — no additives, no nothing, except real fruit. 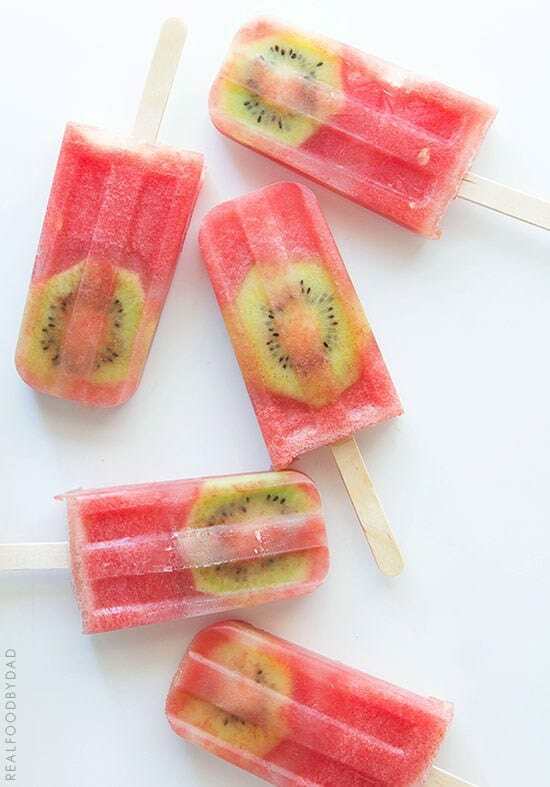 All you need for these pops is 2 ingredients: watermelon and kiwi! This is another gorgeous recipe as you can see the slices of green kiwi against the pretty pink of the watermelon. 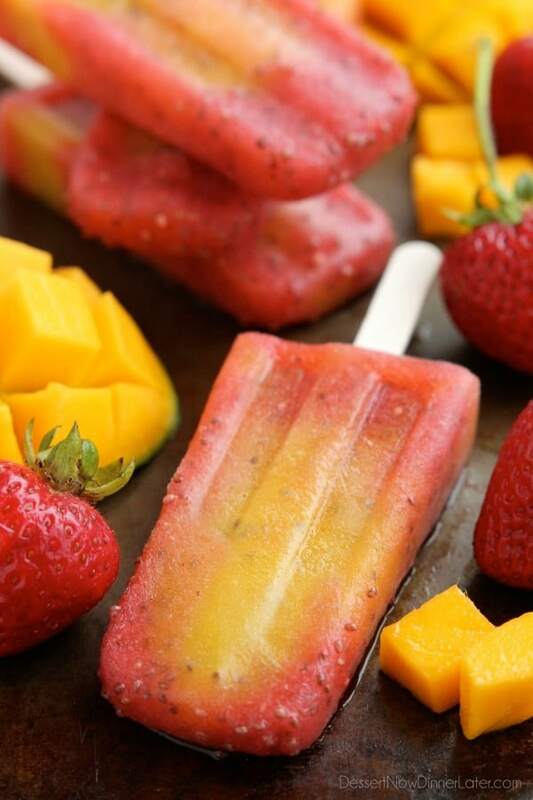 Sure, the strawberry and mango combination isn’t new, but when you add chia seeds and coconut water, that’s something new to try. 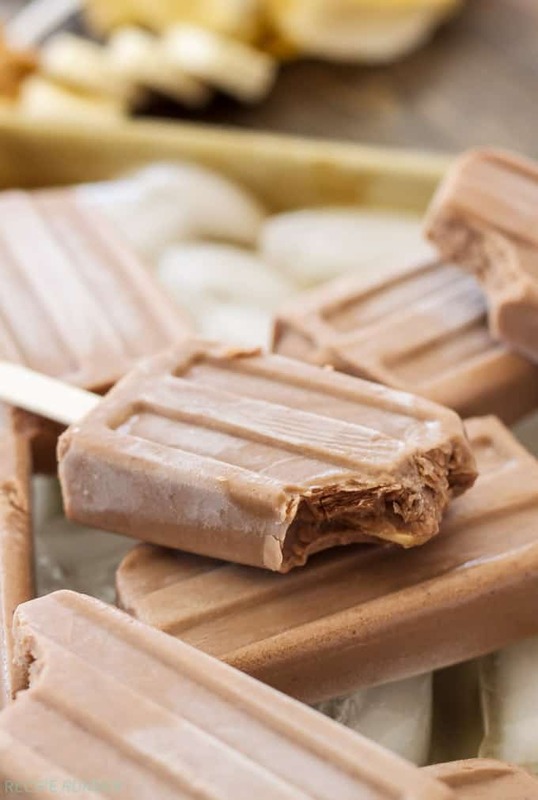 These popsicles are also full of health benefits — protein, fiber, and healthy carbs. 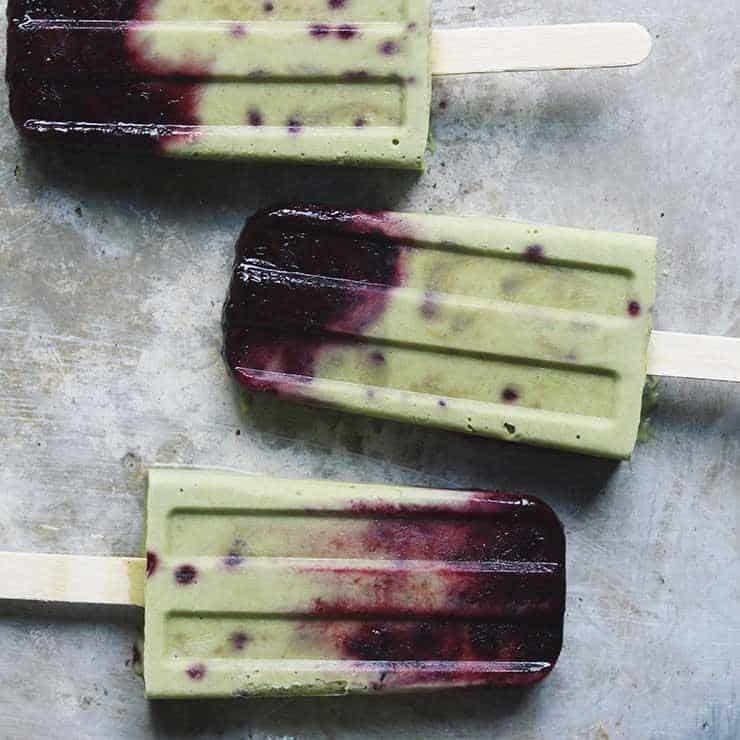 How many popsicles have you seen with chia seeds? Seems worth trying to me! All those fabulous ingredients together? Yes, please! I love PB & banana sandwiches, and anything chocolate, of course. These ingredients couldn’t pair better if they tried. The recipe also calls for almond milk and Greek yogurt for extra creaminess and protein. And, honey! 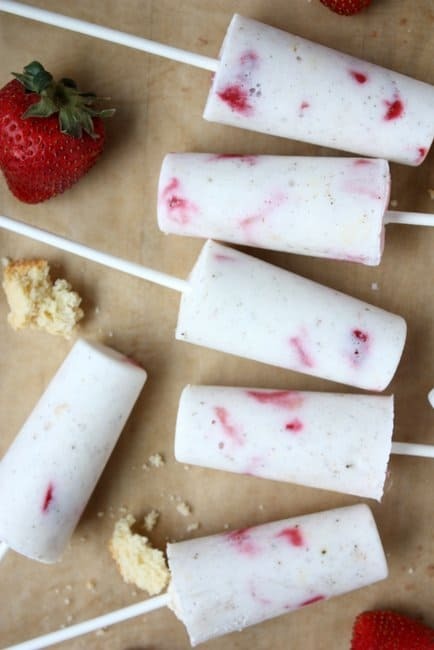 Strawberry shortcake is like the epitome of summer, so why not try making shortcake ice pops? Seems only natural to me. The recipe uses Greek yogurt, so you can feel a little better that you’re not filling those pop trays with heavy cream or sugar. I also really like this recipe because there’s crumbled shortcake in them, almost giving them an ice cream feel. 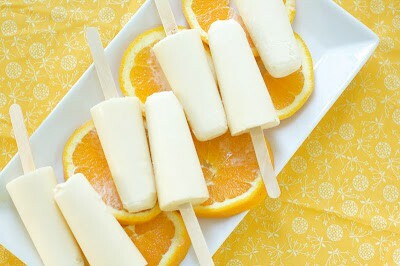 Some people are die-hard creamsicle people in the summer (my dad is one of them). Something about the tart orange flavor combined with the sweetness of cream. These are really easy to make and use all natural ingredients — orange juice, cream, honey, orange extract, and vanilla extract. A total true taste of summer. There’s just something about salted caramel that has regular caramel beat. 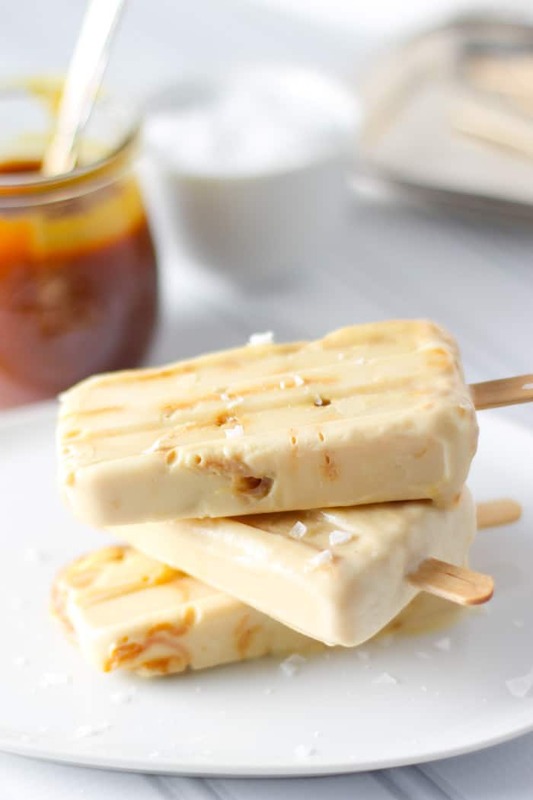 That sweet and salty combo just hits the spot, and the good news is, it’s not that hard to make (recipe shows how to make homemade caramel sauce, and I promise it’s easy). Along with yogurt, the recipe also uses cashew milk for an extra boost of protein for your pops. Coconut makes everything creamier and more delicious, right? Coconut milk is a natural sweetener and pairs great with strawberries. They also look beautiful with a pink and white swirl from the strawberries and milk. The recipe also calls for an extra sweetener — either stevia extract, honey, or maple syrup. Yum! 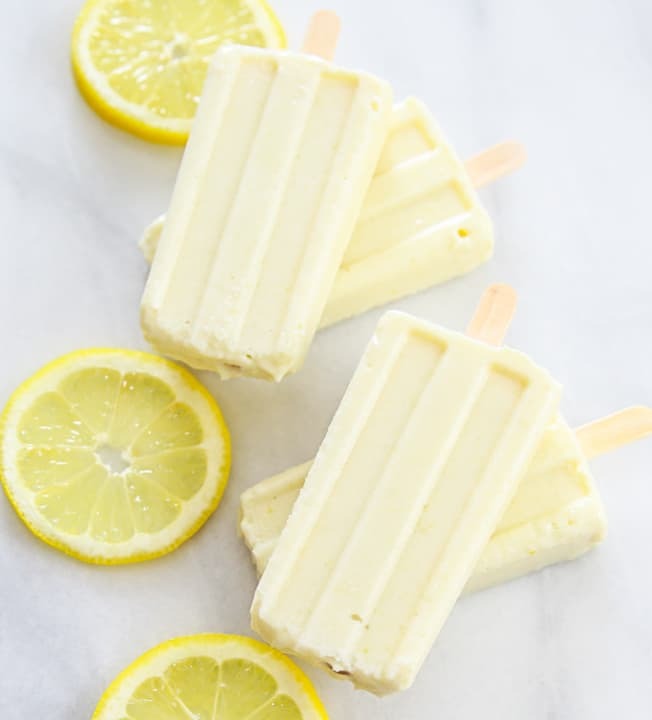 To me, there’s not much else that cools me quite like lemon flavors. Citrus is so fresh and light for your summer palette. And the really great part of this recipe is it actually uses the whole lemon, not just the juice or zest. You literally throw the entire lemon in the blender along with some condensed and whole milk for some extra creaminess. 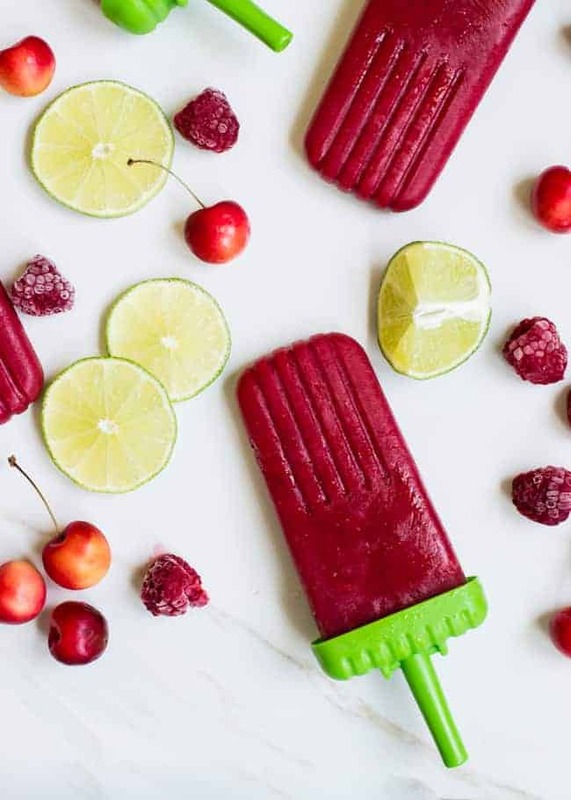 These fruity, fun cocktail popsicles with lime, cherries and raspberries make a great grown-up summer treat. Margaritas, anyone? This popular drink I think would naturally make a great ice pop at a party. 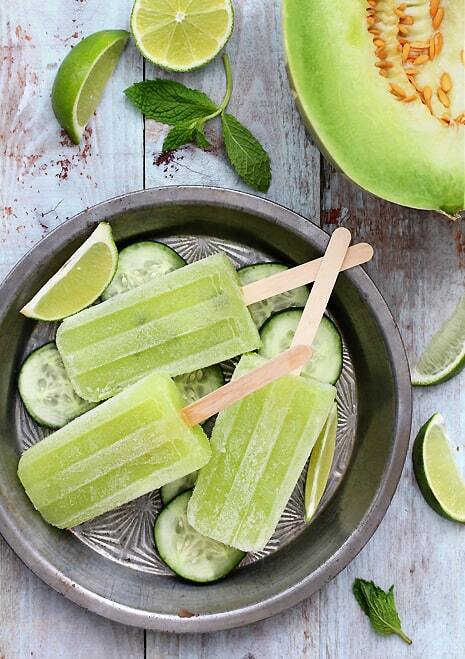 And combined with honeydew and cucumber for an extra cool down factor, how could you go wrong? It’s actually a pretty simple recipe that’s not much different from making a traditional margarita, plus some extra fruit juice for hydration and flavor. Love some summer bourbon? 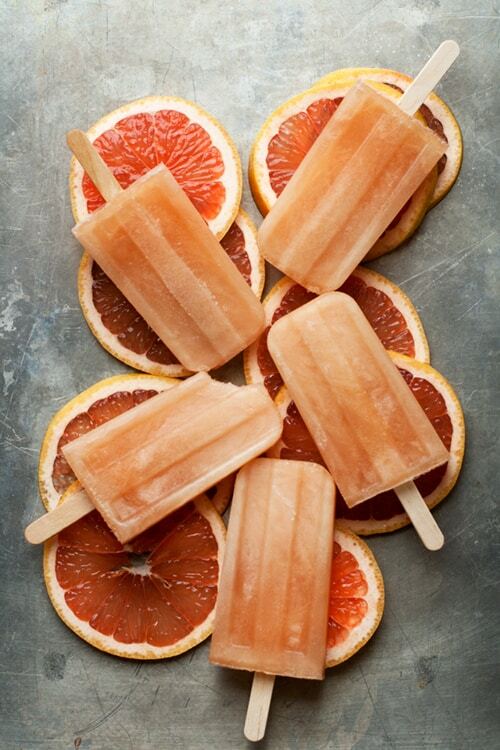 Well, there’s nothing saying you can’t infuse your ice pops with bourbon, too. In this recipe, the bourbon is nicely complimented with grapefruit and maple syrup, and really sounds like a classy treat for a summer outing. OK, I’m definitely not hating on alcoholic popsicles. On a nice hot, summer day, I wouldn’t turn down a treat like this. It’s a clean recipe, and only includes mint leaves, blueberries, rum, lime juice, and just a little sugar. They also look beautiful and are sure to be a great crowd pleaser at a party. MMMMM!!! ThEY LOOK SO GOOD!!!! Look so yummy! Lovely post! Oh my these all look amazing! I really need to get my act together and make some of these this summer!